Standard Continental motors meet or exceed NEMA precision balance definitions. Shafts with rotors are balanced. Internal fans, if any, are added, and the assembly is rebalanced. External fans, if any, are added, and the assembly is rebalanced. All these balance steps are run with a half height, full length key. If the customer supplies a 1/2 coupling, it is mounted utilizing a full height and length key and the entire assembly is rebalanced again. When the balance process is completed, the assembly will be balanced to 2 oz. in per plane or better in 2 planes. Continental's CECO-Seal system is optionally available for all winding types and voltages. This proprietary system is a totally sealed system suitable for testing per IEEE-429. Continental motors, 40 and 50 years old are routinely found in service testifying to the ruggedness of their construction. Part of the reason for this longevity is the standard processes which provide protection from the elements. All unassembled parts of the motor are thoroughly cleaned to remove rust, scale, oxidation, and the oil and grease associated with the manufacturing process. The stator, after the completion of winding, as an assembly, receives a VPI treatment so that the entire core has a polyester or epoxy coating as a base. After assembly and testing, the exterior of the motor is again cleaned and receives another coating of water reducible primer. After the primer has dried, a top coat of a quick dry water reducible enamel is applied, resulting in a total dft of 4-5 mils. Zinc plated hardware is an option is requested and will certainly increase corrosion protection of any motor. If the motor is to be used in an H2S atmosphere, the rotor itself will receive a VPI treatment and all exposed leads will be tinned. As standard Continental will provide an insulation system rated at Class F with the motor designed for B rise and 1.15 service factor. While the following information is provided to show our standards we often will modify our approach, increasing the level of protection in order to provide a motor which exceeds the expectations for the individual rating. Form Wound -All Voltages – All coils are manufactured to meet the exact specifications of the product. Form Wound - Low voltage above 300HP. For VFD use: Medium voltage VFD's do not have the same rise times as low voltage VFD's. The CEM standard insulation is suitable for the MV VFD applications high voltage spike. The coil will have corona shield above 4160 V, 2000 HP. Coil Type construction – dependent on volts per turn ratios. High Poly Thermaleaze with glass coating. High Poly Thermaleaze with double glass coating. Completed coil is wrapped with Mica Tape, and Armor tape, number of layers is voltage and application dependent. Slot Liner: Dacron Mylar Dacron (Class F), Nomex Mylar Nomex (Class H). Top Stick : Dacron Mylar Dacron. VPI – H rated polyester – 1 application standard – CC1305 Solventless Polyester Resin. The CEM standard insulation is suitable for the MV VFD applications high voltage spike. The coil will have corona shield. The slot combination selected for Continental motors provides minimum cusps in the motor speed-torque curves, and aids in magnetic noise suppression. Prime electrical grade silicon steel laminations are stacked in the stator frames for maximum electrical efficiency. The laminations are held in place with steel locking end-rings and full length keys. Additional support is supplied by sturdy press flanges and individual tooth stiffeners in larger motors. Semi-enclosed slots are used for the small ratings, and open slots for larger ratings. The stator core is ground to size to assure a uniform air gap between the core and the rotor. Constructed of cast iron or fabricated steel with sufficient room for connecting incoming leads. Boxes can be rotated in 90° increments. Motors of 600 volts or higher have auxiliary leads, including winding temperature detectors, bearing temperature detectors, and space heater leads brought to a separate terminal box. Specially designed air circulation systems assure cool, long-life motors with maximum performance and efficiency. Each fan is individually balanced for proper air flow and for quiet, vibration-free operation. Random and form-wound coils are placed in pre-insulated slots in the silicon steel cores. Coil extensions are individually tied with glass tape to rolled and welded brace rings to prevent movement caused by starting currents or line surges. After all connections are in place, the stator winding is impregnated in a vacuum pressure impregnation (VPI) system with an environmentally-sensitive varnish and then baked. This assures a homogenous, void-free bond between coils and frame. Store the motor, in it's normal operating position, in a well ventilated, clean dry environment free from vibration and condensing humidity. Cover the motor with a tarp and energize the space heaters to keep the temperature of the winding a few degrees above the surrounding air. If the motor does not does not have space heaters, auxiliary heat should be used to keep the windings warm and free of condensation. Shaft should be rotated by hand every month to keep the bearings lubricated for rust and corrosion prevention and to change the position where the balls rest on the shaft to reduce the chance of brinelling. What is Brinelling? Brinelling is the wear term used to describe surface damage of solids by repeated local impact or by static overload. The term comes from a hardness testing procedure such as the (Brinell hardness test) which indents the surface being checked. Store the motor, in it's normal operating position, in a well ventilated, clean dry environment free from vibration and condensing humidity. Cover the motor with a tarp and energize the space heaters to keep the temperature of the winding a few degrees above the surrounding air. If the motor does not have space heaters, auxiliary heat should be used to keep the windings warm and free of condensation. For grease lube motors, the grease cavity should be completely filled with a moisture resistant grease for storage. For oil lube motors, fill the oil reservoir to it's normal operational level. The shaft should be rotated by hand every month to keep the bearings lubricated for rust prevention and to change the position where the balls rest on the shaft to reduce the chance of brinelling. Upon removal from storage The bearings should be inspected for corrosion and brinelling, prior to installation, and should be re-lubed with an appropriate amount and quantity of grease. The windings should be meggered before connecting on line. The reading should be approximately 2 megohms per each 1000 volts of operating voltage plus 1 megohm, corrected to 40 degrees C.
Any reconditioning required, as noted by the inspections after removal from storage, should be performed prior to putting the motor into service. Reconditioning is not considered a warranty item. Failure to follow these procedures may void the warranty. Laminations are all single piece and punched from minimum M-22 grade non-oriented electrical steel coated with a C-5 high resistance insulation suitable for burnout up to 801 degrees Fahrenheit. Dependent on application considerations M19 and M15 grades of steel may be used. Flux densities are controlled to provide economical use of active materials without diminishing machine performance. Steel densities in the teeth and core assure acceptable levels of saturation, and allow the units to operate at +/- 10% of rated voltage without excessive iron loss. All Continental motors come with copper bar or aluminum die cast rotors. Copper bar rotors provide our design engineers with the greatest flexibility in tailoring a motor to meet the customer needs. We can tailor the bar dimensions as well as copper composition to build a motor that meets your exact performance needs. As a standard, the motor is skewed for smooth starting and quiet operation. Rotor slots are engineered to provide low inrush current while still providing superior starting and running torques. The rotor is designed to have sufficient mass to handle the thermal effects seen during locked rotor and acceleration periods. The end ring temperature rise is much less than the rotor bar allowing the end ring to act as a heat sink for the rotor bar losses. All Continental motors are standard 1.15 service factor or can be quoted with 1.0SF when requested. 2 pole motors as standard will have shafts manufactured from C1045 normalized steel and will contain no welds. For API specifications forged shafts will be provided. 4 pole and slower motors will have shafts manufactured from C1045 steel and have stiffening ribs to insure critical speeds above rated speed. Shaft diameters are selected to give a large safety factor in torsional shear strength. The complete rotor assembly is dynamically balanced. Continental's proprietary and patented oil ring lubrication systems are an option, in addition to our standard oiling system, with all Continental motors. Continental's patented self-contained oil lubricator is mounted on the motor shaft. There is no oil bath, allowing complete lubrication with just 24 ounces of oil, where other systems may require 24 quarts or more. 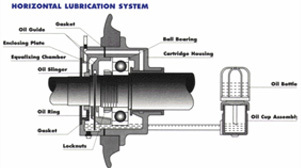 Because the impellers turn with the shaft, lubrication starts the moment the motor is started. Grease- Grease lubricated ball bearings are standard and single shielded to help keep the grease close to the rolling elements. A grease inlet hose with grease fitting supplies grease directly to the bearing. A grease outlet pipe with removable plug is provided. Oil Ring- The oil pumping ring rides directly on the rotor shaft thus delivering oil to the bearings immediately upon startup. Self-lubricating oiler with oil level viewer is provided. Drain is provided in oiler. 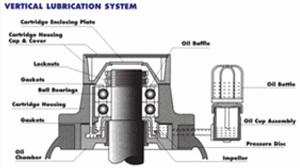 Oil Mist- Oil mist motors have an inlet pipe that directs the oil mist directly onto the bearings. Condensate oil can be relieved via drain plug in the cartridge assembly to prevent lubrication flooding. Oil mist generator is typically provided by others. Oil Forced- Forced lubricated motors have an inlet pipe that directs the oil mist directly into the bearing housings. The return path is provided by an outlet pipe that runs directly to the lubrication generator. The forced oil system is typically provided by others. Grease- Grease lubricated ball bearings are single shielded to help keep the grease close to the rolling elements. A grease inlet hose with grease fitting supplies grease directly to the bearing. A grease outlet pipe with removable plug is provided. Oil- CEM proprietary impeller- The oil pumping impeller is driven by the rotor shaft thus delivering oil to the bearings immediately upon startup. Self-lubricating oiler with oil level viewer is provided. Drain is provided in oiler. Oil- Tilting Pad – Oil bath lubricated. These bearings sit in an oil bath to aid in keeping the bearings cool. Oil level viewer is provided. Normally a cooling coil is part of the assembly, sitting in the oil bath. Coolant is typically water from a city connection, or chiller system, provided by others. Oil Mist- Oil mist motors have an inlet pipe that directs the oil mist directly on to the bearings. Condensate oil can be relieved via drain plug in the cartridge assembly to prevent lubrication flooding. Oil mist generator is typically provided by others. Anti Friction Bearing Lubrication Selection. Â© 2011 Continental Electric Motors. All Rights Reserved.